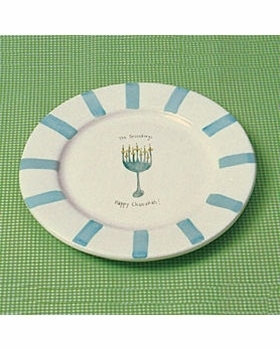 Celebrate Hanukkah this year with our hand painted custom plate or platter. Why not commemorate this year either of these pieces to your Chanukah meals and dishes - and make it a tradition to bring it out every year as part of your holiday celebration. 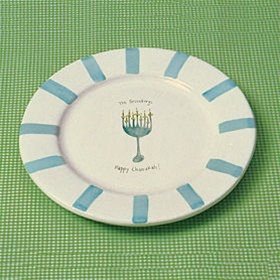 Each platter is hand painted with blue stripes along the rim, a whimsically illustrated menorah and your family's name at the top with "Happy Chanukah!" at the bottom. Makes a wonderful gift! Platter measures 13.5".